It is so hard to give up the notion, "If they don't know this, they can't learn that." I see it all the time, this arrow on learning and it does not fit how children learn. It does not make sense. Did we understand the concept of gravity before our first attempt at climbing a tree or even walking? Learning does not naturally take place in the direction of the arrow on this image, and when we force this path of knowledge acquisition, e are going against how the brain works, therefore making our job and the job of our students much harder. Can you imagine the student that did not get fractions the first time? Whether they missed school, the concept was never understood, or the instruction did not help the understanding, the student feels a sense of failure. Now every year in math class, students are reminded that they are failures because every teacher brings up the fact that you must understand fractions to understand the rest of the curriculum. And while this is true for some concepts in Algebra 1, how many can we teach without fractions. Could I push so far as to say that the child may be able to understand many of the algebraic concepts even if they did not master fractions? Please understand, I am in no way saying that we should not teach fractions. But I do think that teaching a concept and showing students the need for fractions is a better way to go. The Algebra 1 curriculum has countless skills that need fractions. But I would challenge you to teach the Algebra 1 curriculum first and add the prerequisites as necessary. This will allow students to feel successful in a new concept. This alone proves to your students that their brains are ready to learn the concept they once thought hard. When we present new material to students instead of reteaching the same concepts over and over, we are telling students that we believe in them and that we know they can learn this material. Read more about this in a previous blog post, Be Careful what You Reteach. Know what prerequisites are going to hold up your students and make a plan to introduce them at an appropriate time. I call this Layering Your Lesson. Your first objection needs to be your Algebra 1 curriculum, and then you can add the prerequisites into your lesson one at a time. Think of it this way. If every student is talking to you at the same time, you can't hear or process all of the information. Your students will feel the same way if you are presenting them with 2, 3 or 4 unmastered skills at the same time. Remember, one skill at a time and always begin with your curriculum. The most important piece of this topic is how you communicate it to the students. Be positive. Discuss brain development with them. They don't understand that their brain may not have been ready to learn something. This does not make them dumb or unable to learn. They simply were not ready, and they are now! I love the new blog and would love to share it with the math staff of our county; however, can you please correct the spelling of Analyzing on the picture before I do? Please realize that this graphic was taken from outside of North America. The creator chose to share it on Ficker for free use. If anyone is great with creating graphics like this, and is willing to share, I would love to include it for all the readers in the U.S and Canada. Thanks for the donation! The new graphic is ready! I like your 'analysis' of the pedagogy of a curriculum, based on your 'knowledge' and 'comprehension' of a typical scope and sequence of an algebra text. i.e. the order of topics is not always justified and can actually be detrimental, particularly considering the affective domain. ALTHOUGH, I think Dr. Bloom would roll over in his grave because of your 'misapplication' of the cognitive domain model. I suppose that your faulty 'evaluation' of the model is due to your lack of 'knowledge' and 'comprehension' of the model itself. Curiously (rhetorically, I presume), have you read either of the primary sources on 'Blooms Taxonomy'? In other words, it is not necessary for you to malign 'Blooms Taxonomy' to make your (valid) points about the algebra curriculum and associated pedagogy. **I often see faulty 'applications' of Bloom's work and most often it is because the person has never taken the time to actually develop their own 'analysis' and 'evaluation' based on their own 'knowledge and comprehension' of the primary sources. They are in effect repeating someone else's 'evaluation or analysis'. 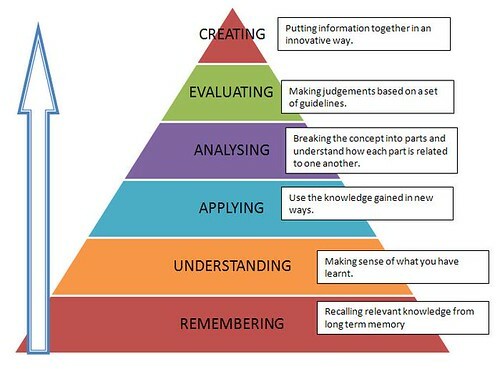 Again, I like your points but I take offense to the misrepresentation of Bloom's Taxonomy'.